Moussaka is an eggplant based casserole dish native to the Mediterranean and the Middle East. It comes in a range of styles and flavors. Some are not layered and look more like a stew. The Greek version is the best known and has layers of eggplant, tomato sauce, and meat (lamb or beef) topped with a white sauce. My weekend food find mentioned in my previous post included a Vegetable Moussaka. This version is more like a stew with eggplants, zucchinis, and potatoes. The dish was a tad oily but still very delicious. I really liked it and wanted to recreate it in a more traditional layered style. I used long Chinese eggplants and small round eggplants which cook more easily. They are also more juicy so that the dish will not be dry. Using a non-stick pan, I fried the eggplants in 3 batches using only 1 teaspoon of oil each time. I did the same with the zucchinis. I put a thin layer of breadcrumbs at the bottom to help absorb any excessive juices. The dish turned out really well. It was moist and very flavorful. Will definitely make this again. There was just the right amount of juices, not too much as to make it soggy and not too little as to make it dry. Happy Spring! 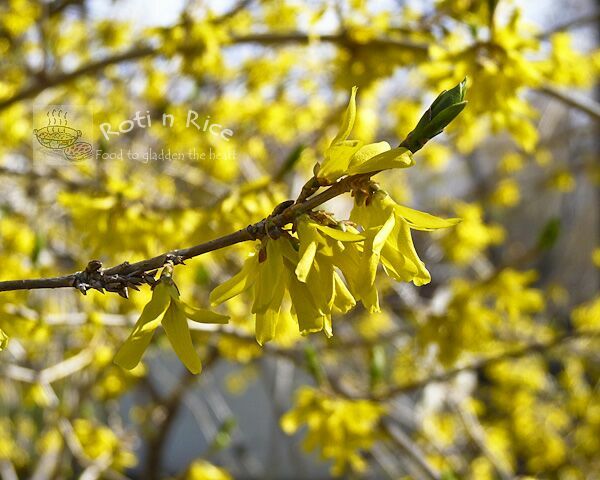 My forsythia bush is giving a brilliant show of vibrant yellow flowers. Would you believe I've never had moussaka before? This looks lovely – so moist and tender and all that cheese on top makes me want to dive right in with my fork! Your moussaka looks and sounds superb! Love it! Moussaka looks yummy. This is completely new to me. Now it goes to my must try list. thanks for sharing dear. 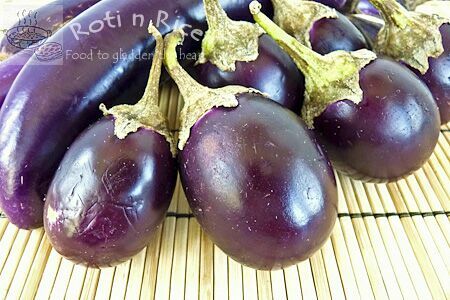 hi biren…the dish is totally new to me…I don't like eggplant that much…but I can prepare this dish with something else instead of eggplant right?? ?though that would not be the real version…the dish looks very tempting..
Love Moussaka! Love it meatless too. I use bread crumbs instead of bechamel on mine as well, though I'd love to find a way to lighten that up so I could use it. Looks very delicious. Looks easy…just bake. Your moussaka looks really good! Even though it's made from vegetables it looks like a hearty dish. And great comfort food. I read your comment on my burger club post and I just wanted to clear up that we all make the same burger – the green chile one I posted. Sometimes my writing isn't clear enough – I'm sorry. But I would love it if you joined in. This sounds really fabulous. I need all the help I can get trying to incorporate more veggies into my diet! I so have to try this moussaka recipe friend. I haven't eaten moussaka is a long time, and have never prepared it. It's about time I change those facts. Thanks for the inspiration. What a delicious way to add eggplant to your diet! I will have to try your recipe. I adore moussaka and this vegetarian version looks delicious. Forsythia bushes always make me feel as though spring has actually arrived. 5 Star Foodie – Thanks! Kamalika – Zucchinis and potatoes will do very well in this dish. Scott K – I have not tried the ones with the bechamel sauce but I am thinking that it will probably be delicious. Cinnamon-Girl – It is a hearty dish and makes a nice light lunch on its own. Thanks for clarifying….I will try to join. It's time to fire up the grill. luvtoeat – Perhaps you can use zucchinis and potatoes instead. I think a lot of people may actually prefer it with some meat. Either lamb or beef will work. redkathy – I do hope you will try it. It is good on its own as a light lunch. Eggplants are beautiful. I've never actually made anything with them. This would be a good recipe to try first. It's like tigerfish mentioned…it's like a lasagna where the eggplant serves as the noodle. Looks delicious! tigefish – LOL! We can certainly try to convert Garfield 🙂 This dish does look like a vegetable lasagna. Fantastic. We were just talking about eggplants at work and surfing for recipes. I'll pass this along! Thank you so much Andrea for your kind and heart warming compliments. 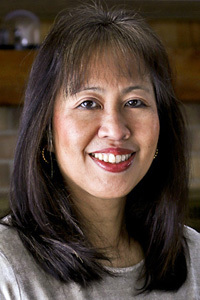 I am very happy to hear that you have tried many of my recipes and they have worked well for you. We all cook to the taste of our families based on availability of ingredients and personal comfort zones. I applaud you for taking the initiative to swap out the ingredients for the ones you prefer. That is what home cooking is all about – making good food the way we like it, not what others dictate. Thank you once again for your very encouraging words.